Biting into a piece is paneer is a creamy, rich and chewy experience. But it’s an experience that can be hard to come by – you can’t just pick up a block of paneer from your local grocery store (unless you live in Flushing, Queens and Patel Brothers is your local grocery store – in which case, I’m a little jealous). I usually pick up two blocks from the Indian grocery store – one to use then and one to freeze for later. But sometimes, despite good planning, my stockpile is empty. Tofu is a good “substitute” for paneer. I use the word “substitute” lightly because, tofu doesn’t give you the same taste (obviously – what tastes like fried cheese but isn’t?! If you know, please tell me). Biting into a piece of pan fried tofu is a nutty, savoury-sweet chewy and slightly crispy experience. So yes, not paneer but still quite yummy and satisfying. And tofu soaks up Indian spices and sauces and takes on their taste. So, here’s my riff on Kadai Paneer, a traditional Indian dish of paneer and bellpeppers, using tofu instead. While I can’t say we don’t miss the paneer when eating Kadai Tofu even the slightest bit, I can say that we each have a huge second helping and don’t sit around feeling sorry for our paneer-less state. If you can find them, I recommend using a red, yellow and green pepper. The red and yellow peppers are sweet and the green slightly bitter, which makes for a great crispy combination together. And if you happen to have paneer, then by all means feel free to substitute it for the tofu. In a wide, deep skillet heat about a tablespoon of cooking oil in medium heat then add the onions, garlic, ginger and green chilis. Cook for about 3-5 minutes stirring frequently so the onions don’t brown until they become glassy. Add the tomatoes and cook until the tomatoes wilt. Add the bellpeppers and cook partially covered for about 10 minutes until the bellpeppers soften. In a separate skillet, heat about a teaspoon of cooking oil and pan fry the tofu in batches (don’t crowd the pan) until browned on the top. Flip each piece and brown the other side. Add tofu to the onion-tomato mixture. Stir in all of the spices and mix well. Continue cooking uncovered on medium low heat for another 4-5 minutes. Remove from heat and stir in milk. If you use yogurt, whisk the yogurt until smooth before adding. This adds a little creaminess and acidity to the dish. Shower with chopped cilantro. Looks super delish, Nithya! Loved the color and looks of this dish. Looks absolutely delicious. Its so true that tofu can never replace paneer in taste and texture. But I still love to use them both. I’ll have to try this. I love tofu in stir fries and the sauce looks delicious! 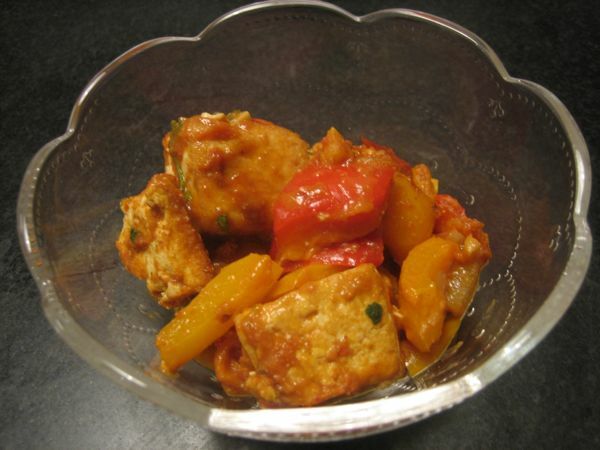 I love paneer, but haven’t been able to find it, so maybe I should try substituting tofu! I love all the spices in this dish, it looks great! I use tofu all the time as a paneer substitute and love it. In fact, it’s healthier than paneer so what’s not to love, right? 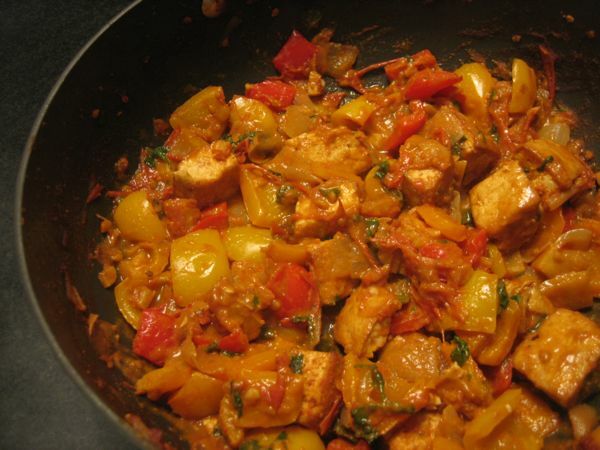 This kadai tofu is amazing– love how rich it looks. Hi Nithya — we made this the other night and it was great and so easy! Thanks for sharing. @Ruby – glad it turned out well and that you were able to use up your bell peppers and tofu. How do you get your tofu not to break? I buy extra firm tofu, but somehow I manage to break it up all the time. I even wait to make sure it is completely browned before flipping over, etc. @Vina – Do you put pressure on it while frying? Or do you break the block up slightly when squeezing the water out? Those are two reasons your tofu might break. I usually cut each piece about one inch thick. I used Sprouted Tofu recently (you can see it in this picture of Red Curry Noodles, and it’s remarkably firm and chewy. There’s not even any water to be drained. I’ve made this a couple of times now and it’s really yummy. I have to confess that I wimped out over the chilis and chili powder, using just a pinch of cayenne pepper. I also didn’t have fresh ginger, so used 1/2 dried instead and, after my tofu stuck all over my pan, the next time I sprayed it with low-cal oil spray and baked it instead.